Posted by pf in Credit Card, Expenses and Savings, Net Worth Update. Over the next couple of months, I should get a healthy “shot in the arm” to my net worth as a result of tax refunds, work bonus, stimulus package, etc. This should be thrilling. However, as I write this, I am a bit disappointed. However, my dissatisfaction comes not from these wonderful things, but rather from what seems to be an increasingly larger and larger credit card bill. The size of the credit card bill is not so much the issue (we run large credit card debt when we are doing arbitrage), but rather some of its content and frequency. Granted, there are some extenuating circumstances where we had the holidays and some trips that were back-to-back in the last couple of months. I’m generally ok with this, but it feels like it’s having a bit of a “drag” effect and won’t quite go away. This, coupled with normal expenses such as groceries, extra-curricular activities for the kids, and the like are bumming me out. It “feels” a bit out of control (perception is reality, eh?). So, now having done my net worth for February, I’m feeling a bit disjointed and disappointed. 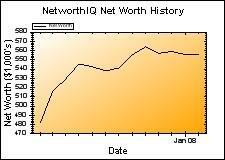 Looking at my updated chart for net worth below, we are just meandering sideways. Of course, a lot of that has to do with the performance of the stock market. However, I also know that our credit card purchases over the last several months are not helping any. In the final analysis, I know things will turn around and we’ll get back on the growth track. I will just have to redouble my efforts to be vigilant about our spending and make sure that the “blip” is just that…and does not become a trend. I can really hear you beating yourself up. You can’t change what has happened. So instead focus on what you can do and take action to put it right. And from what you have written I get the impression that you will. So head up, be postive and move forward with a plan of action to support where you want to get to. Based upon your e-mail, it appears you might be reading from the UK. Welcome! Ultimately, you are correct and I appreciate your comments. It’s just that I’m a bit frustrated at this moving sideways bit…especially when I have the ability to control some of it. Deep down, I think I’m a bit concerned that as our income rises, I am paying a bit less attention than before…and that bothers me. If we are really going to make it, we have to be consistent in our approach throughout, and not get lazy. the president breaks his promise on health care premium savings….